Dream Interpretation According To The Quran And Sunnah By Dr. Abu Ameenah Bilal Philips. 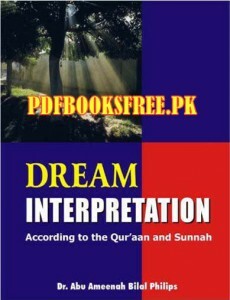 Dream meaning and interpretations as per the Islamic education. Dream interpretation has been a long established tradition in the Muslim East. However, it has become so mixed up with superstition, myths and fortunetelling, that most educated Muslims shun this area. The fact of the matter is that dream interpretation is mentioned in the Qur’aan and was regularly practised by the Prophet (ρ), himself. Consequently, there is a real need to understand this subject, especially, considering that humans spend about a third of their lives sleeping. The contents of this book provide a reliable basis for understanding dreams and their interpretation and that the book itself will become a recognized alternative to the fabricated and unauthentic texts that are presently in wide circulation among Muslims. Visit the following link to read online and download Dream Interpretation complete book in Pdf format for offline learning and references.